Almost everyone hopes and strives for a long-term relationship, but few are ever able to find and cement a mutually satisfying, compatible bond that lasts the rest of their lives. Those who place great importance on the fantasy of permanent, romantic bliss may see this as a tragedy, but we believe that’s an erroneous, dysfunctional perspective. Short-term relationships end for various reasons, including people changing and evolving or regressing at different rates over time, the shattering of illusions resulting in broken alliances, and “good” and “bad” love karma and personal timing: most connections, we have discovered in our work, have destined beginning and ending times. 1) Singles seeking financial security or couples who can’t afford to break up yet. It’s common for couples to remain together because creating a second household would be too expensive. The divorce rate during the recent economic downturn has decreased, and reduced incomes is the number one reason. All facades aside, financial security as the primary motivation for entering a relationship makes the connection a business relationship, not a love relationship. Adherents to the traditional American marriage model and those with a sense of entitlement deny it and express outrage when we point it out, but this sort of arrangement is essentially matrimonial prostitution. Please note, we believe how anyone chooses to live their love life is their business (not the government’s, and not society’s), unless they are being dishonest and, or using or abusing someone. We’re just calling it like we see it. 2) Those who are afraid of change, being single or alone, or are seeking happiness outside of themselves. These types will wait it out until they are forced to change, or they will end up feeling alone and isolated, even while in a relationship, because of their fear. 3) Those who feel a marriage or long-term relationship is a requirement to be a good parent. Unfortunately, a bad relationship will take the focus off a child and all will suffer in the process. Because of this, we recommend a child contract (which protects the child along with the primary caretaker) instead of a marriage contract. 4) And finally, most couples get married assuming they have what it takes to remain together, but then realize months or years later they lack the most important element, which happens to be metaphysically oriented: The good love karma of their predestined life circumstances that allows them to experience, for the most part, a harmonious, happy, long-term relationship. We estimate this is only about 15% of the population. Is there something wrong with you if you don’t experience a rewarding longer-term or life-long relationship? It’s easy to think so if you get caught up in what you are “supposed to do” as a “normal” member of society. If you aren’t involved in an ideal, longer-term relationship, don’t fret. Perceptions and expectations about the way love lives “should” be cause more misery than almost any other issue. Instead of comparing yourself with those who seem to have what you’d like (remember, appearances can be very deceiving) and generating regret and despair, accept where you are, be grateful for all you have such as relationships with friends and family, learn to love yourself and occasional solitude, and refuse to buy into romantic fairytales. Speaking from experience I know it can be extremely difficult to go through a break up; especially if the break up was not mutual and you are still very much in love with him. You can become consumed with thoughts of how to get him back after a break up. You feel as if your heart is literally breaking, and all kinds of thoughts are going through your head; like how am I going to go on without him, what could I have done differently, or is he seeing another woman; just to name a few. Right now I’m sure you’re thinking of every trick in the book to try and get him back, but your thoughts are going to be irrational because you are thinking with your heart and not your mind. I’m going to share with you some common mistakes to avoid, that most women make after a break up; that could be reconciliation suicide. Don’t Beg and Plead – Ladies I know you are very emotional right now, but let me school you; this is neither attractive nor is it going to help you get your ex back. In his eyes you are going to look weak and needy and these are not the type of qualities a man wants in a woman. Don’t Use Guilt or Reasoning – trying to use guilt to get him back will get you nothing but negative results. Constantly trying to convince him of why he was so wrong to leave you will cause him to shut down and not listen to a word you say. He will consider this as nagging and will use it against you as one of the reasons why he left. Ultimately no matter how bad the break up or what caused it, all is not lost. Your relationship can still be repaired and you can get him back after a break up; if you know how. So ladies, I have provided you with some common mistakes to avoid on how to get him back after a break up. However, I have a few more tricks up my sleeve that I’d like to share with you that are crucial to getting him back. So, if you don’t want to spend another lonely day or sleepless night without him; go to http://squidoo.com/how-to-get-him-back-after-a-break-up-12 for more information. Do you really need a stack of stone to seclude your property from obnoxious elements? Or will a pile of sturdy bricks create an enjoyable milieu for everyone? Obviously, these ideas convey specific challenges on how creative we can be in looking for possible solutions in transforming a simple matter into an aesthetic and refreshing one. It may look difficult sometimes, but here are some valuable ideas why landscape designers opt to use outdoor artificial hedges as living fortresses. 1.) Artificial boxwood hedge creates a clear dimension in pathways and pedestrian traffic. Pedestrian lanes nowadays are unsafe to cross without any assistance due to number of reckless drivers and uncontrollable vehicle speed or road widths. Others are not minding the serious injuries it may cause once they follow their own whims. That is why adults and children must be wary all the time. Because of these, experts created the state of the art outdoor artificial plants to separate the roads and to guide the motorists to the right directions. And utilizing the artificial boxwood hedge gives a clear view of the scene before the crowd cross the pedestrian lane. 2.) Large outdoor artificial hedges can keep your children and pets from accidents. If your children enjoy playing basketball or hide and seek and just running around together with their pets outdoor, install a living-wall privacy fences that will keep them from fatalities. A solid fake hedge in a plain planter can barricade your backyard and block the ball from rolling on the street. And since outdoor artificial hedges are made of polyurethane material, they are perfectly effective in dividing a room from the rest of the playground for a more naturalistic surrounding. 3.) Fake Hedge can maintain the privacy around the vicinity. Privacy is very much an issue especially if you dont have ample time to rest and relax. It would be more inspiring to contemplate alone in your patio or garden if there are artificial vines like outdoor artificial ivy and bougainvillea intertwined in pergola and blended with the real blooms of azaleas and gardenias. The ambiance will be creatively refreshing and soothing as the artificial plants outdoor dance with the wind. More to that, these faux foliages are rated first-class and designed to be used in exterior applications which can absolutely screen you from any unpleasant external sights and sounds. 4.) Faux Hedges provide a living wall from the prying eyes of the neighbors. Some people are not obligated to say hello and wave their hands to their neighbors once they step outside their fence. Others are too quiet continuing with their business without spending much of their time talking because they feel more comfortable with it. And using the outdoor artificial hedges is the best wall in keeping you away from the inquisitive eyes. You can enjoy your own activities in the balcony or swimming pool area because they are tightly constructed and designed to uphold the security at home. Lyan Osalia is an author and researcher for HooksandLattice.com. She enjoys sharing her discoveries of unique displays of artificial shrub and fake hedges for both home and commercial use.For more information you can call 800-896-0978. There was a family of several of these beautiful Mourning Doves the other day, 16 July 2014, along one of the gravel roads just within the SW city limits. I’ve never yet seen one perched on a fence post, but always way up on a high wire. Not as sharp as I would have liked. "A graceful, slender-tailed, small-headed dove that’s common across the continent. 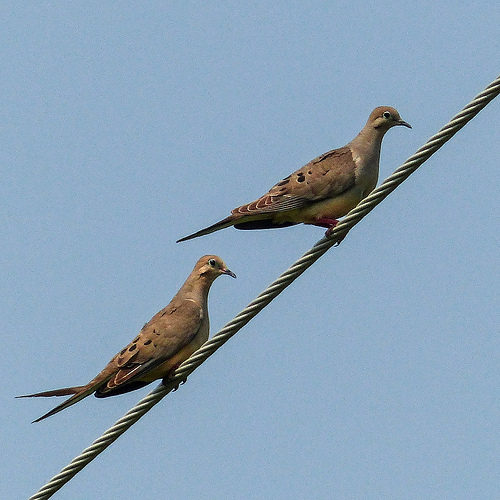 Mourning Doves perch on telephone wires and forage for seeds on the ground; their flight is fast and bullet straight. Their soft, drawn-out calls sound like laments. When taking off, their wings make a sharp whistling or whinnying. Mourning Doves are the most frequently hunted species in North America. The Mourning Dove is the most widespread and abundant game bird in North America. Every year hunters harvest more than 20 million, but the Mourning Dove remains one of our most abundant birds with a U.S. population estimated at 350 million. The oldest known Mourning Dove was 31 years 4 months old." From AllABoutBirds.